What role does equity have in designing the built environment? Equity is the quality of being fair and impartial. It could be defined as a state in which all people, regardless of their socioeconomic, racial, or ethnic background, have fair and just access to the resources and opportunities necessary to thrive. As designers, and in our communities, how do we keep fairness at the forefront of what we are working toward? Is our work fair, and if not, why? How can we become more equitable designers? These are the questions we will explore during our 2019 Leadership Forum. Equity + Design will highlight local designers, architects, community organizers, activists, and other change-makers who are working to address the social, economic, and political challenges they face while trying to create a more equitable built environment. They will give us advice about what we can do today to create more equitable places, and provide insight into how our roles as designers may change and evolve into the future. Please join us Wednesday May 29th, 2019, from 6 to 9 pm at Preston Bradley Hall in the Chicago Cultural Center. 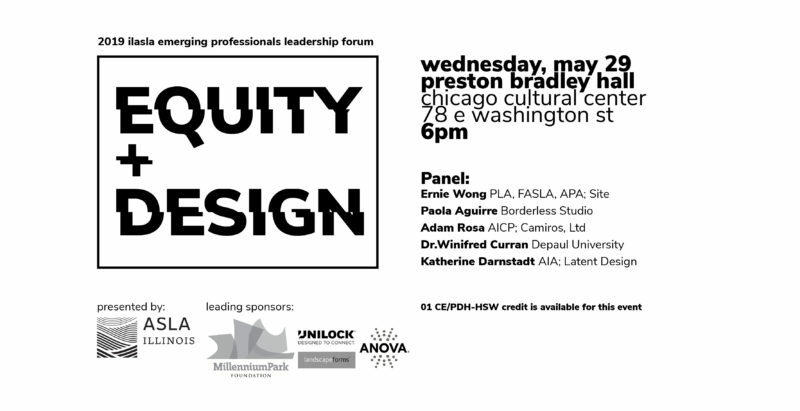 This year’s forum will consist of a two-minute overview by each panelist, in which they will describe their philosophy of and approach to equitable design. This will be followed by a moderator-led Q&A with both prepared and audience-generated questions. Panelists to be announced in the coming weeks. Join us before and after for light bites, wine, and stimulating conversation. 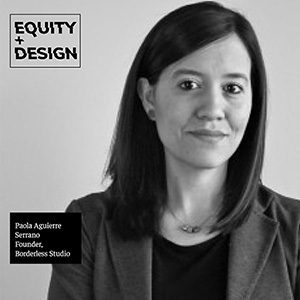 Paola Aguirre Serrano is the founder of BORDERLESS Studio | Workshop— Chicago-based urban design and research practice focused on collaborative and interdisciplinary projects. With an emphasis on exchange and communication across disciplines, Borderless explores creative city design and civic engagement proposals that address the complexity of urban systems and social equity by looking at intersections between architecture, urban design, infrastructure, landscape, planning, and participatory processes. Paola’s professional experience includes working with government agencies, non-profit organizations, universities and architecture/urban design offices in Mexico and the United States in projects at various scales—from regions to neighborhoods. She is an active educator, and currently teaches at The School of the Art Institute of Chicago, and has taught at Washington University in St. Louis and Archeworks. 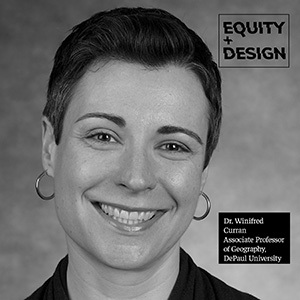 Dr. Winifred Curran is an associate professor of geography at DePaul University. Her research focuses on understanding the effects of gentrification on the urban landscape, looking at labor, policing, environmental gentrification and the gendering of urban policy. She is the author of Gender and Gentrification (Routledge 2018) and co-editor, with Trina Hamilton, of Just Green Enough: Urban Development and Environmental Gentrification (Routledge 2018). Her work has appeared in Urban Studies, International Journal of Urban and Regional Research, Environment and Planning A, Urban Geography, and Local Environment. She was a Public Voices Fellow with the Op-Ed Project, with op-eds published in The New York Times, Daily Beast, and The Conversation. She received her PhD from Clark University. 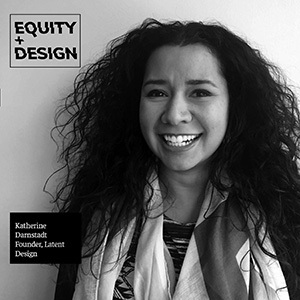 Katherine Darnstadt is the founder of Latent Design, a progressive architecture and urbanism firm leveraging civic innovation and social impact to design more equitable spaces and systems. Since founding her practice in 2010, Katherine and her firm have prototyped new urban design systems to advance urban agriculture, support small business, created spaces for youth makers, advanced building innovation, and created public space frameworks. She and the firm have been published, exhibited and featured widely, most notably at the International Venice Architecture Biennial, Architizer A+ Awards, Chicago Ideas Week, NPR, American Institute of Architects Young Architects Honor Award winner and Crain’s Chicago 40 Under 40. She currently teaches at Northwestern University and The School of the Art Institute of Chicago. 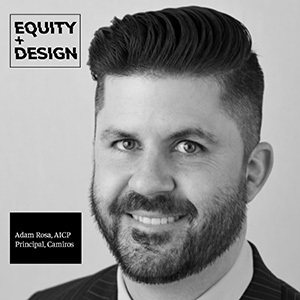 As a Principal with Camiros, Adam Rosa, AICP has 20 years of experience in creating implementable plans focused on placemaking and improving existing neighborhoods. In his work with communities nationwide, Adam continuously strives to generate creative ideas and solutions that capture the culture, spirit, and potential of local residents. Adam has led Choice Neighborhoods Initiative planning efforts focused on the revitalization of distressed public housing areas in diverse communities. Adam has taken an active role in focusing on youth engagement as a key element of community planning and has presented on this topic at recent state and national conferences. Adam has been honored as one of NextCity’s 40-under-40 Vanguard and has recently been inducted into Lambda Alpha International for his work in neighborhood planning and revitalization. Adam is a strong proponent for local improvements throughout Chicago and currently acts as the President of Hawthorne Neighbors, a north-side neighborhood association near Wrigley Field. 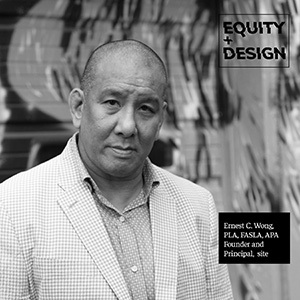 Ernest C. Wong, Founder and Principal of site, has been instrumental in the development of both the firm and the landscape architecture profession in the City of Chicago. An advocate of contextually designed public open spaces and urban parks, Mr. Wong has directed numerous acclaimed projects including Mary Bartelme Park, Henry Palmisano Park (formerly Stearns Quarry), and Argyle Shared Street. Through professional and service leadership, Mr. Wong has advocated for and helped shaped Chicago’s Chinatown community through transformative, community-oriented projects including the multi-phased Tom Memorial Park, the Chinatown Vision Plan, the Chinatown Branch Library, and more. A strong proponent of civic and community engagement, Mr. Wong sits on the board of numerous service organizations and professional juries including the Driehaus Award for Architectural Excellence in Community Design, Near South Planning Board, and the Chicago Landmarks Commission. In addition, Mr. Wong is a frequent speaker at universities as well as design, business, and diversity conferences, including serving as the keynote speaker at the National Minority Supplier Development Council in 2016.